Stimulants are drugs that cause the heart rate to increase, blood pressure to rise, and metabolism to increase. Stimulants include legal prescription drugs, such as methylphenidate (Ritalin); legal substances, such as nicotine and caffeine; and illegal drugs, such as cocaine and amphetamine. Divide the students into small groups of three or four. Tell them that as a result of the tools available for studying the brain, which they learned about in Module 2, it is possible to see the difference between a brain that has been exposed to stimulants and one that has not. In particular, PET scans show brain activity and can show the effect that drugs have on the brain. Direct students to the following Web site: http://faculty.washington.edu/chudler/coca.html. Have the groups look at the images of a brain that has not been exposed to drugs and one that has. It might be a good idea for students to refer to the Brain Fact Sheets. Can you tell what parts of the brain are being shown on the scans? What does it mean when certain parts of the brain have been activated? Is it good or bad that different parts of the brain have been activated? What do you think would happen to the brain if it is exposed to cocaine all the time? Have each group write a couple of paragraphs or a list answering these questions. Then share some of their responses. What were some ideas expressed by the students? Conclude the mission by watching the remainder of the DVD. Once the DVD is over, write a class statement about the effects of cocaine on the brain. Write the statement on a piece of newsprint and save it for further use. 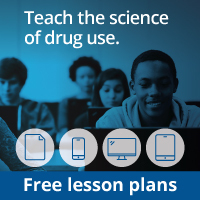 Based on what the students have learned about the brain so far, ask them why they think people take drugs in the first place. Remind the students to think about the scrapbooks they created in the first module and the impact of drugs on our society. Have the students discuss this question with their friends and family. What new ideas did people come up with?